"To honour the dead, all these years later 40kg of clay was recently uplifted from the battlefield where the Canterbury and Otago troops were stationed the night before the attack. 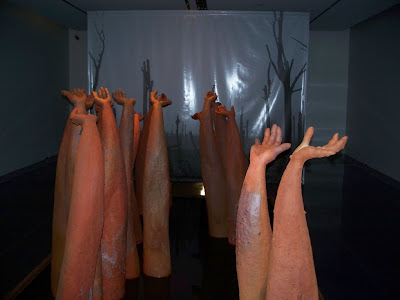 This black clay, with all that it contains and signifies, was then fired with unprocessed clay from New Zealand's Coromandel to become this "forest" of clay arms rising upwards from still waters, representing the futility of war and the indestructibility of the human spirit." The title comes from the poem "The Hollow Men" by T. S. Eliot. I took a wander through the Museum's Centennial Street exhibition as well. This has long been part of the museum's interior landscape, originally created by Milne & Choyce department store in 1966. I still remember school trips where we were trundled through the narrow "streets" of the exhibit (I wish I knew then what I know now about some of the names to the buildings -- I'd have appreciated it much more!) Centennial Street is probably partially to blame for my intense interest in Auckland's story today, though. The above photograph is of an object which is no longer labelled, but I realised what it was by looking at an old (1966) booklet on the exhibit which I had the good sense to buy secondhand recently. 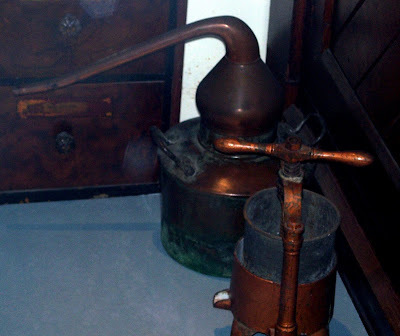 This is a copper retort or still (a picture of another one here) once owned by noted analytical chemist and homeopathic pharmacist, James Alexander Pond. Pond was the chap that was called in to check out the quality of Auckland's water during the 1870s-1880s. I have an article in my collection from that period where he was interviewed by a journalist, and tied a white handkerchief to a tap overnight by way of demonstration. In the morning, the white cloth was grey, and Pond then showed, by microscope, all the little organisms floating around in the city's non-alcoholic drink of necessity. "A notable patent was granted to Pond in 1885 for the manufacture of enamel-lined butter boxes, which were constructed in his own factory at Freemans Bay. The novelty of the patent lay in the application of an alcoholic solution of shellac under pressure to the kahikatea box. The butter box set the standard for subsequent models, although its use appears to have died out about 1889, partly because of the cost. After his retirement in 1911 Pond continued his scientific work in his well-equipped home laboratory in Remuera. He patented a new process for the manufacture of superphosphate in 1927, and was particularly concerned to find a poison for ragwort. In this miniature agricultural research station he developed a large-leafed variety of imported clover and a variety of white-skinned onion, and cultivated tung oil trees." In September 1930, the town clerk of Hobart wrote to our Auckland City Council offering an elephant, describing him as "a great source of attraction for children and other." 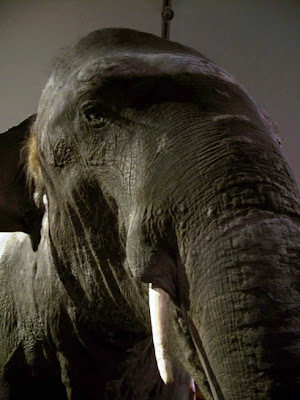 Rajah the elephant was 13 years old, 8 foot 3 inches at the shoulder and 9 feet 4 inches in total height. Hobart emphasised that he was tame, that they only wanted to part with him as the novelty of elephant rides had worn off for their citizenry and their zoo needed to cut costs. Auckland purchased him for £125, and Rajah arrived via Sydney in November that year. The shipping company at the time demanded special insurance before they'd take Rajah on board. "Rajah's stall is empty, and there is no longer any need to keep his copper name-plate bright and shining, but he will not be forgotten. His skin and skeleton have been turned over to the taxidermist, and the people will be able to gaze upon his mighty bulk at the Auckland War Memorial Museum for many years to come." There seemed to be a fashion of kicking the old elephants to the kerb in that time period; Queenie, a popular elephant at Melb Zoo, killed her cruel keeper at the zoo but(officially) she was shot due to shortages of food during WW2. I must say those arms reaching upwards are very haunting, exactly what you'd expect from the mud and blood of that slaughter.